Now available in Antique White! 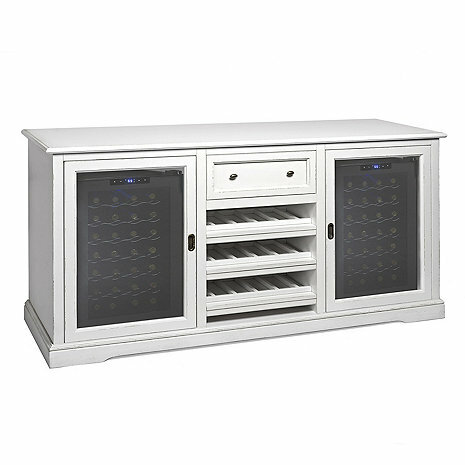 1 spacious storage area with a sliding pocket glass door, adjustable shelves, and room for our 9-glass Stemware Rack*. **Important Note: When installing the 28 bottle units into your credenza, you will need to remove the back panel. This easy process requires removing the screws from the back of the unit. *Note: Shelving is meant to hold standard Bordeaux size bottles, using larger size bottles may limit the capacity. If you would like to store larger bottles you can easily remove any of the shelves. This will also prevent scraping the labels on the larger bottles. *Note: Shelving is meant to hold standard Bordeaux size bottles, using larger size bottles may limit the capacity. If you would like to store larger bottles you can easily remove any of the shelves. This will also prevent scraping the labels on the larger bottles. is there a way to convert/use one of the refrigerators (or both) for other beverages, such as beer/soda (with a shelves)? BEST ANSWER: absolutely we remove racks put large bottles on bottom, multipurpose we even chill some snack trays as needed, we love it. If you remove a shelf, then I'm sure you can, but the shelfs are specifically designed for wine.